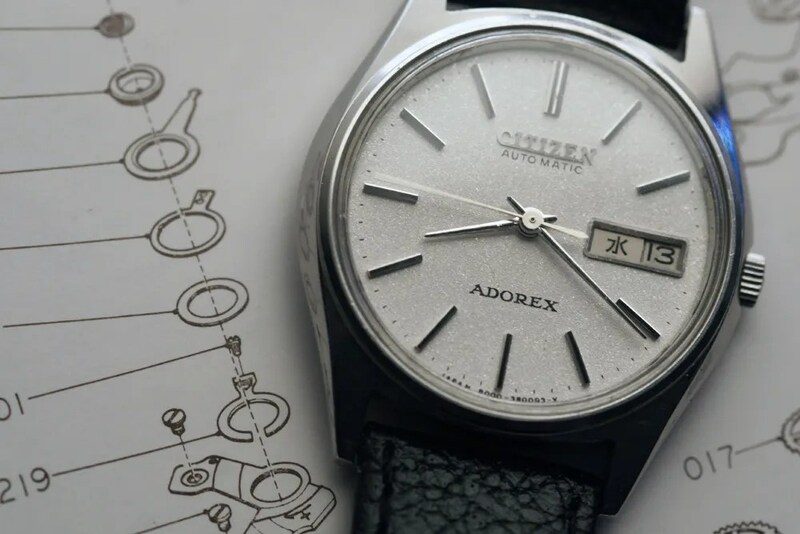 In the early 1970s Citizen were making a range of high quality automatic mechanical and electro-mechanical watches as their production development reached its peak, just before the introduction of mass produced quartz models transformed the landscape. 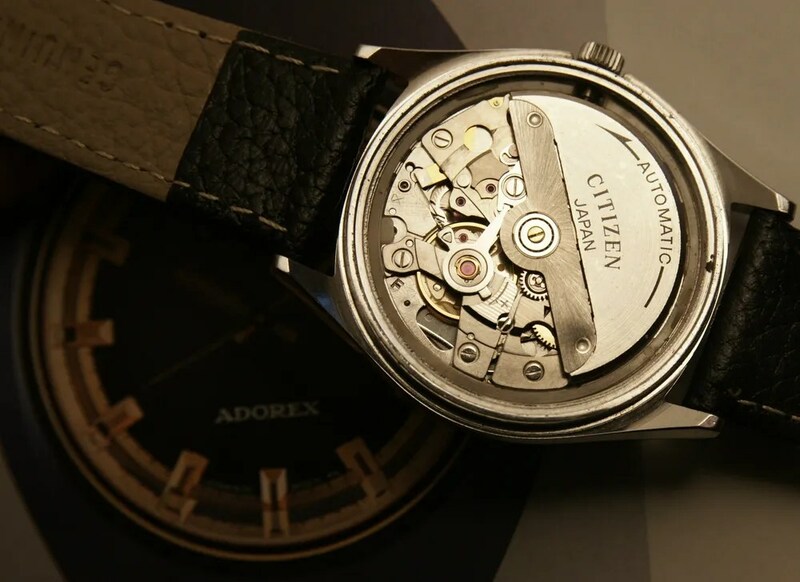 An example of Citizen’s expertise and innovation is the ‘Adorex’ line – especially those models with the 25 jewel 8000/8001 movement (technically the 8000A/8001A, but I don’t believe any other variants were made). 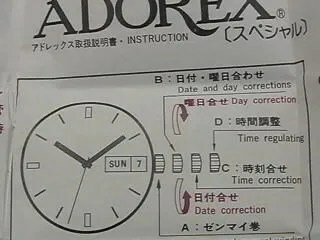 The Adorex models used two movements, during only a short production run starting in 1974 – the 8000 and the 8050. 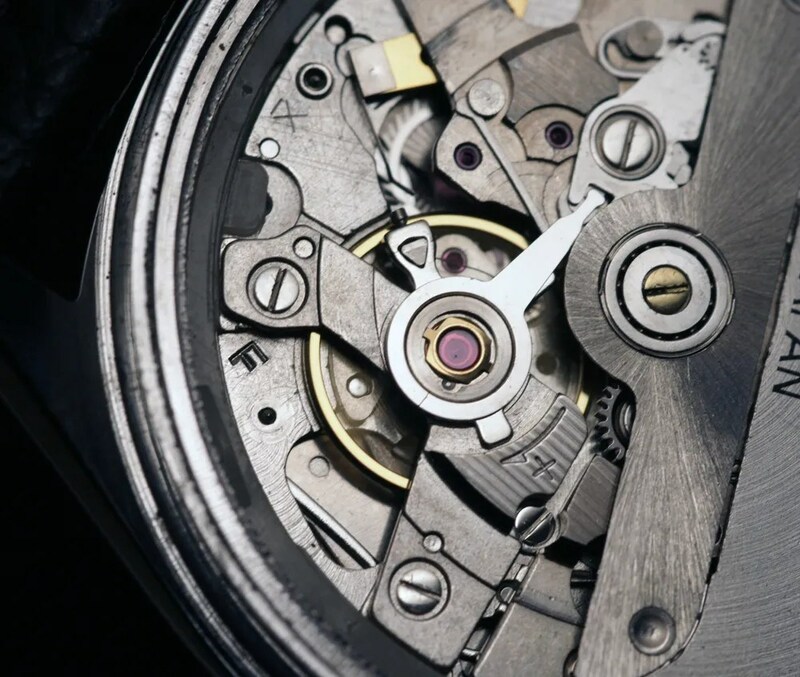 But it is the 8000 movement that is of greatest interest, since it has a unique feature not seen in any other model before or since, as far as I know…. 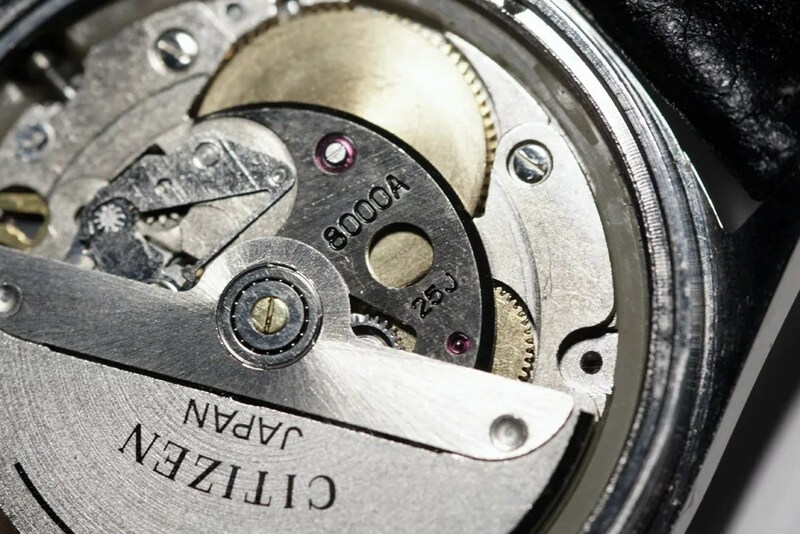 The design was probably not deemed to be too practical – the degree of movement for regulation is necessarily small, and not being able to see the gear as it is moved would make it difficult to use without removing the case back. So it’s an innovation that was only seen in this model and therefore short-lived – yet fascinating to see and now to have in the collection. And remember, if you are looking to acquire one of these, it is only found on the 8000/8001 movement, whilst the 8050 Adorex’s have the conventional type of fine adjuster. 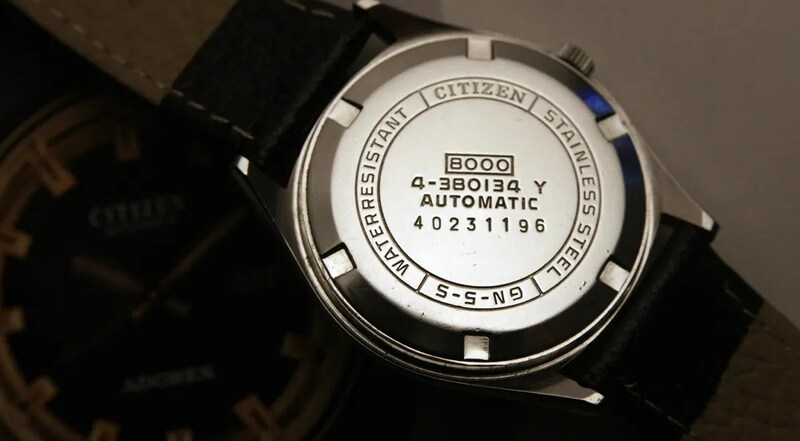 This entry was posted in Vintage Watches and tagged Citizen Adorex, Vintage Citizen High Beat, Vintage Citizen Watches. Bookmark the permalink. Reblogged this on Vintage Watches Middle East. wow… I never knew this feature existed (fine tuning via crown) and now I want one!! Hi Anil, thanks for visiting my blog. It is, as far as I know, a unique design. I’m not sure it is very practical in reality since with the case back still on you can’t see how much the adjuster is moving, and very fine adjustments are needed. Still, it is an interesting thing to have 🙂 And remember it is only the 8000 movement that had this, not the 8050. Hi, I’ve just purchased an Adorex 8000 which arrived in the post yesterday. It’s my first Citizen watch and I love it! Your article was very interesting and a learnt plenty about the watch. One question I did have was whether you know how to remove the crown as I would like to clean the case? Any help would be greatly appreciated. Hi Richard, thanks for visiting my blog, and good to hear my post on the Adorex was useful 🙂 The 8000 version is quite hard to find, compared to the 8050, but of course it’s the more interesting one because it has the unique fine adjustment mechanism via the crown. Because of that I wasn’t sure whether the crown would be removed in the usual way, so I had a look at mine. And it is removed via the usual method, so it is straightforward. First off, pull the crown out to the time setting position (no need to pull it out further, i.e. to the fine adjustment position). Then gently press the button near the stem to release it – the button on mine moved easily with just gentle pressure (a very small screw driver should do it). Just reverse the procedure to re-fit the stem and crown. I emphasise being gentle since sometimes these buttons can stick when pressed down, and the movement might have to be partly dismantled to release it. Please be sure that you are happy to do this at your own risk before you go ahead! Here’s a pic showing the button, but please note that the crown is fully in & therefore not in the time setting position which is required before you press the button and pull it out. The watch is all back together and I’ve taken some pics, but not sure how/where to post them? Also I’ve had to fit a bracelet extension as it was a bit short – any ideas on betting more links? I realise you will need to see the pictures first! Hi Richard – I’m afraid only I am allowed to post pics here. If you can upload to somewhere like PhotoBucket you can post a link. Or if you wish I can email you and you can send pics to me. I have a few questions about it – does the case look polished to you? To me, it looks like the case back is polished since the engraving is a bit shallow. Also, the caseback doesn’t seem like a screw down. Is it supposed to be opened from the front? all-in-all, is it a legit watch? Thanks again man. BTW – I’m enjoying the Cosmotron I just bought. Thanks to you for posting a ton of information on the line. Good to see you have a Cosmotron, they are great watches – and glad you found my info useful.